I read this article and found it very interesting, thought it might be something for you. The article is called How Modi Changed (And Changed) The Demonetisation Narrative and is located at https://archive.indiaspend.com/cover-story/how-modi-changed-and-changed-the-demonetisation-narrative-54391. 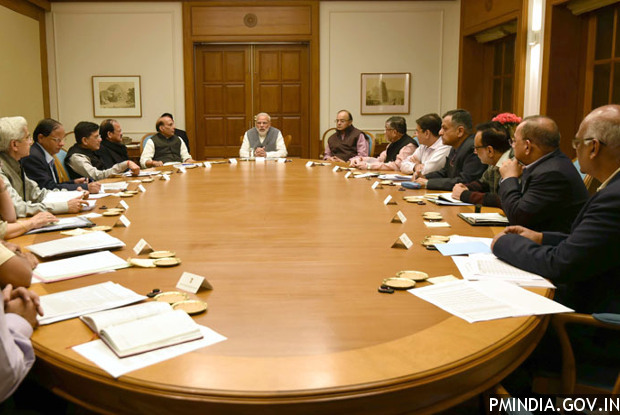 Prime Minister Narendra Modi chairs a meeting on demonetisation, on November 13, 2016. An IndiaSpend analysis of the Prime Minister’s seven speeches reveals a shifting of the narrative of the demonetisation action and its objectives. Prime Minister Narendra Modi addressed the nation on November 8, 2016 to announce the withdrawal of Rs 500 and Rs 1,000 notes. The speech (in English) lasted 25 minutes. The Prime Minister uttered the phrase “black money” 18 times in this speech. He mentioned “fake currency” or “counterfeit” five times in the same speech. It was unambiguously clear from the Prime Minister’s speech that the primary motivation for the sudden withdrawal of nearly 86% of the country’s currency was the evil of black money. The next day, the papers termed it a “war on black money”. PayTM, a mobile payment app, hailed the decision with a full-page ad and the Prime Minister left for Japan. By the time the Prime Minister returned from Japan, the move had been christened “demonetisation” in English, “notebandi” in Hindi and there was a war-time like rationing of currency in the country. The Prime Minister made six speeches across the country on the demonetisation policy between November 13 and November 27, including his radio address to the nation, Mann Ki Baat, according to data available on the Prime Minister’s personal website. The text of all the speeches are available on the website. A data analysis of the speeches (after translation) reveals a shifting of the narrative of the demonetisation action and its objectives. In his speech on November 8, 2016, when he announced the demonetisation policy, the Prime Minister used the phrase “black money” four times more than “fake/counterfeit currency”. By November 27, he used the phrase “digital/cashless” thrice as much as “black money” with no mention of “fake currency”. Recall, there was zero mention of “digital/cashless” in the initial November 8 speech. The chart below shows the ratio of the three narratives–“black money”, “fake currency” and “cashless/digital pay”–in each of the Prime Minister’s speeches over three weeks and seven speeches. In other words, in the same speech, how many times did the Prime Minister use each of these phrases to describe the reasons for demonetisation which can be used as a proxy to understand what the Prime Minister believes was the primary objective for this mammoth exercise. The saffron line representing the “cashless/digital” phrase in the Prime Minister’s speeches went from 0 in the November 8 speech to a 73% ratio in the November 27 speech. The green line representing the phrase “fake currency” went from 22% to 0 in the same period suggesting the Prime Minister no longer believes that terror financing was the primary or secondary driver of this demonetisation exercise. The black line representing the phrase “black money” went from a high of a 80% ratio on November 8 to only 27% on November 27. Apparently, it is no longer a “war on black money” but instead a “war on all currency” to go cashless. So, between November 8 and November 27, the objective for the demonetisation exercise has swung from black money elimination to going cashless, as evident in the Prime Minister’s speeches. To be sure, urging citizens to use less cash and resort to digital transactions is a laudable objective and must certainly be encouraged. But when a decision was taken to remove a whopping 86% of the country’s currency overnight with all its attendant costs, one would have hoped there was one strong rationale for it, even if it meant achieving multiple objectives. Either the Prime Minister has realised that the original primary objective of eliminating black money may not be met or there was not adequate thought behind the decision. The process that started from November 8 is to curb illegal transactions which create black money or assets. Govt. is going as per their plan. PM has asked for 50 days, and also said that tough measures will follow. What an excellent analysis and graphic display of the motive behind the Prime Minister’s decision on demonetisation. The moot point is that all these analysis are based on the speeches made by the Prime Minister between November 8th and 27th. It is clear that if the intention of the government is to eliminate black money and fake currency from the system, then it has failed. A year from now, demonetisation will be seen as an initiative of international banking interests carried out by a compliant BJP. Right fron Ibrahim Lodhi to all Mughals, I mean till Aurangazeb, had ruled Delhi. Do you think they have their inheritance here now? Its their time now. It will come to an end in the coming years, and they will be in history books again. Don’t agree with the conclusion that the objective of elimination of black money has not been met. Holders of black money have been made to realise they can be checked, and the nation knows there is someone who is genuinely trying to eliminate the menace of black money from this country. May not be fully but black money will be eliminated partially from the economy. Horrible analysis! Going cashless is a way to eliminate use of currency notes from day-to-day transactions. India is massively inconvenienced by demonetisation because we do not see a means of exchange of goods and services without use of currency notes. Had it not been the case, withdrawing currency notes would be an easy task to curb black money and counterfeiting. Its true that words changed but I don’t think the primary objective has changed. While implementing demonetisation, there are many steps taken by the government but the prime focus was to curb black money. Implementation of digital/cashless transactions is one of the steps for effective implementation to stop black money. I do not think for one minute the removal of 86% of the total currency was for doing away illegal operations. Lies, more lies and dammed lies. 1. This may force many poor people, who now hold worthless notes, to give up some gold to feed themselves. 2. This will undoubtedly recapitalise the banks that may have been in trouble. 3. The additional taxes collected will bring plenty of money for the rapacious Government. Once things normalise, the common folk who were burned will hold gold in mass and barely trust any currency. Black markets, tax evasion and corruption will surge more than before. India will face severe depression in 2017, all from one man’s edict. Trust lost is never gained. The story idea is appreciable. Whatever term we use for the economic phenomenon that emerged after the 8th November speech of the Prime Minister is entwined. I hope we, as common citizen, find ourselves standing in greener pastures after 50 days as promised by the Prime Minister. Otherwise, he should prepare himself to be riding on the sliding graph of his and his party’s popularity. If “cashless” is the objective, no need to take 125 crore people for a 50 days trial ride AND it does not warrant “secrecy” as mentioned by Modi in his first speech on 08/11/2016. The war was about black money and government is achieving its goal. Cashless transactions will also led to the decline of black money. I don’t think that the war has been diverted. What about fighting terrorism? It appeared prominently in a couple of speeches! If the PM hadn’t changed the usage of various terms keeping them constant, am sure you would have said that he has no ideas and is harping on the same tune! How do you know that all this was not pre-planned to address various sections of society in a gradual form? @ Ranjan, yes a good and colourful (!) analysis, but wrong conclusions drawn. I call this part of a mischievous campaign by detractors. The prime purpose, as I saw it on day 1 of withdrawal of high denomination notes, was to punish bribe takers, black money gatherers/ hoarders and tax dodgers and terror/drug financiers. Attack on FICN pushers is a secondary gain. The greatest “collateral benefit”, as I termed it on day 2 in many fora, was a great leap forward towards electronic payments, a “less cash” economy (I prefer this over their term Cashless). Another prediction I made by day 3 was “after hectic days of the bankmen, wait for hectic activities by ITmen, thanks to IT (pun intended)”. From audit trail of cash flows, focus will gradually shift towards ‘benami’ property and high value transactions. Even simple folks have understood this. Have U? I believe digital economy was very much a part of Mr. Modi’s original intent. Otherwise, withdrawing Rs 500/Rs 1,000 notes serves only a temporary purpose. Black money would have built up again with new notes. Only digital banking can reduce the incidence of black money. If so, why didn’t Mr. Modi say it at the outset? He already had to deal with the cash withdrawal resistance and chaos. If he had said we’re going digital, everyone would have got doubly freaked out, more chaos and anger. I was born in India and worked there for 20-years. I am still an Indian by heart. We must accept Indians have their own logic. Trying to modernise India using western logic is going to be like trying to mix oil and water. Our implementation skills would make an imbecile feel like Einstein. (b) When above us achieved, prepare for note replacement systematically; do not mention black money or demonetisation. For RS 2,000, just say inflation requires a bigger note (and it should have been Rs 5,000 by the way). For Rs 500, just say there are counterfeiting issues or time we got a woman on our currency or whatever makes good PR. (c) When everything is in place, demonetise. (d) And of course, try not to be stupid, which is very hard for our government. New rules every day? What is the matter with these people? Occasionally, I am asked to make project plans. I take pencil and paper, and map everything that can go wrong. I don’t have to stage expensive surveys. I just visualise myself at each step and see what can go wrong. If public is the target of the report, I turn myself into an aam adami – all it takes is empathy and knowing how ordinary people in India have to live. My aim is that even an expert should not find flaws with the steps I take. I live in Australia and have handled Australian currency transactions only a couple of times a year. India can surely become a cashless economy.